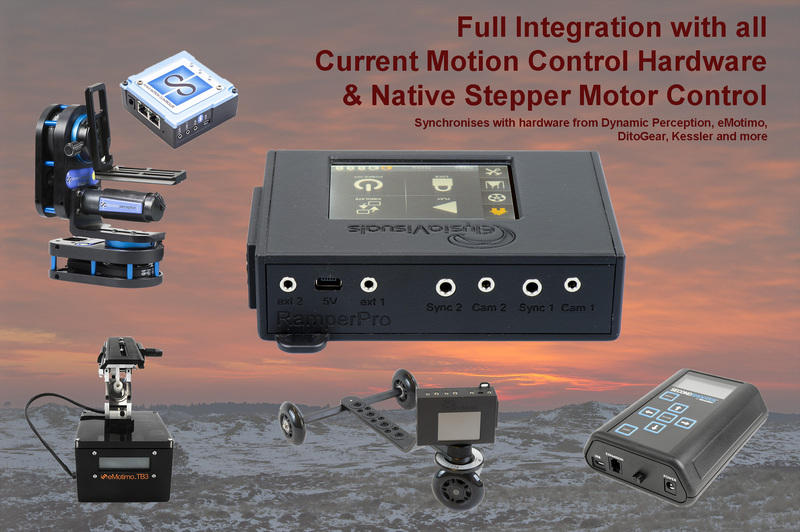 Create advanced timelapse movies with the ElysiaVisuals RamperPro camera controller. This is the most advanced and capable timelapse controller in the world. The RamperPro can truly deliver full automatic ramping. It has never been more easy to setup your RamperPro. The new firmware that is included with the RamperPro3 now offers a two screen setup. Just set your start exposure and the interval and you can create stunning sunset and sunrise timelapse movies. The RamperPro3 is in stock. 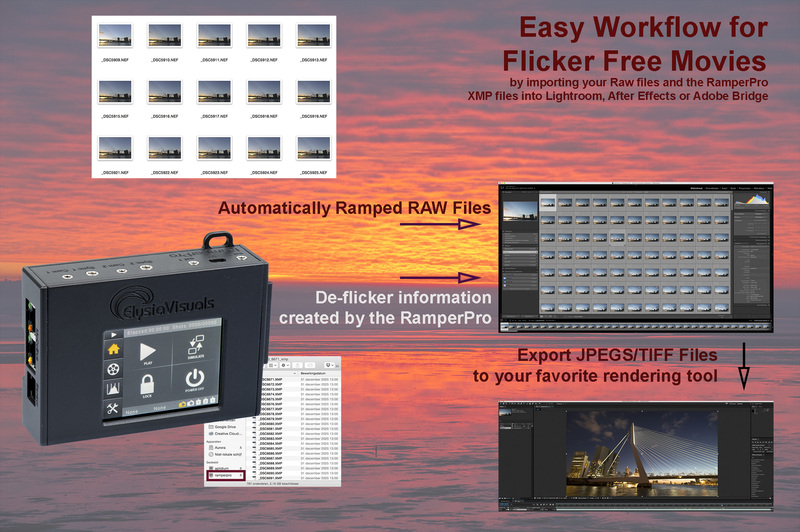 The RamperPro now offers support for advanced day->night->day shoots. Please Note: This is the brand new RamperPro3 that is now equiped with WiFi and Bluetooth support. You can now use the RamperPro App to follow your progress and images at full resolution on your smart phone, tablet and laptop. The new WiFi capabilities make it possible to connect your smartphone, tablet and laptop to your RamperPro. You can review the progress of your shoot and the images that are shot at full resolution. This also makes it possible to keep an eye on your RamperPro from a distance of from your warm car. Is has never been so easy to create ramping timelapse movies. 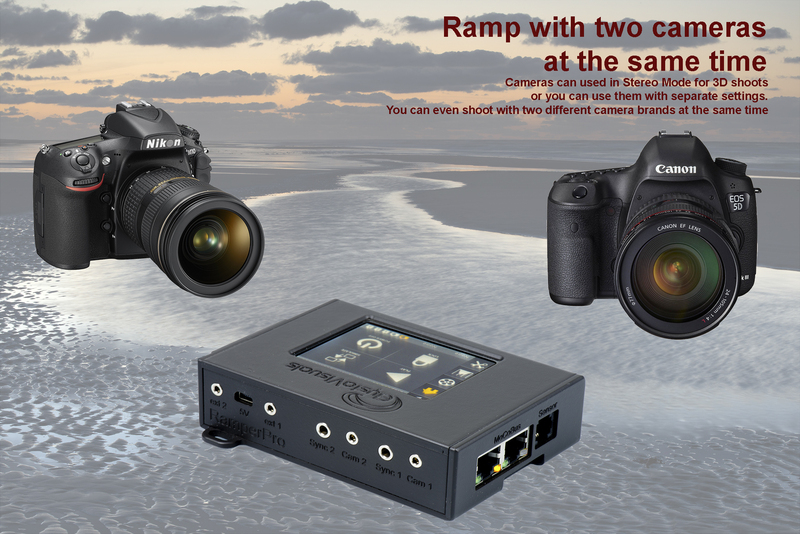 The Ramper Pro supports fully automatic exposure ramping with USB control for two camera's. You can use any desired shutter speed or any desired bulb speed to create ramping sequences. The camera is automatically controlled via USB by the controller. That makes it possible to automatically shift the ISO during your shoot. The RamperPro can therefore easily ramp over 20 stops from bright day light to stars. We like to talk about exposure ramping and not about bulb ramping because you are not limited to bulb mode when you use the RamperPro. Integration with motion control hardware is very important and the RamperPro has no limitations on that side. There are four IO ports then can be hooked up to the Dynamic Perception MX2 and MX3. You can also connect the RamperPro to an eMotimo TB3 pan and tilt head. The RamperPro acts as an external intervalometer on these devices. Please always use our isolator adapter when you connect the RamperPro to other hardware. That way you optically isolate the RamperPro from the connected second party hardware. A very exiting development is the open source MoCoBus protocol. You can daisy chain many MoCoBus devices like nanoMoCo enabled stepper motors, the MX3 and the RamperPro. The RamperPro has two fully enabled MoCoBus connectors that make it possible for the RamperPro to be an advanced motion controller for MoCoBus devices. This means that you can control a nanoMoCo or NMx enabled Stage Zero or Stage One dolly with the RamperPro. The RamperPro has many settings that are needed to configure the device. Don't be overwhelmed by this. Please note that most settings can be set twice because the RamperPro is in fact two advanced time lapse controllers in one package. Secondly, many settings are overruled when you use the automatic mode. More about Sony support can be found in the RamperPro manual. Missing current Nikon and Canon models will be added as soon as possible. Please contact us if your camera model is not supported yet. Use a "USB" battery with a 5V output. There is a mini USB connection at the back of the RamperPro that you can use to power the unit. This USB port is not a "real" USB port; it is only there to power the RamperPro from a steady 5V power supply. We offer a powerful USB battery that gives the RamperPro 10 hours runtime. 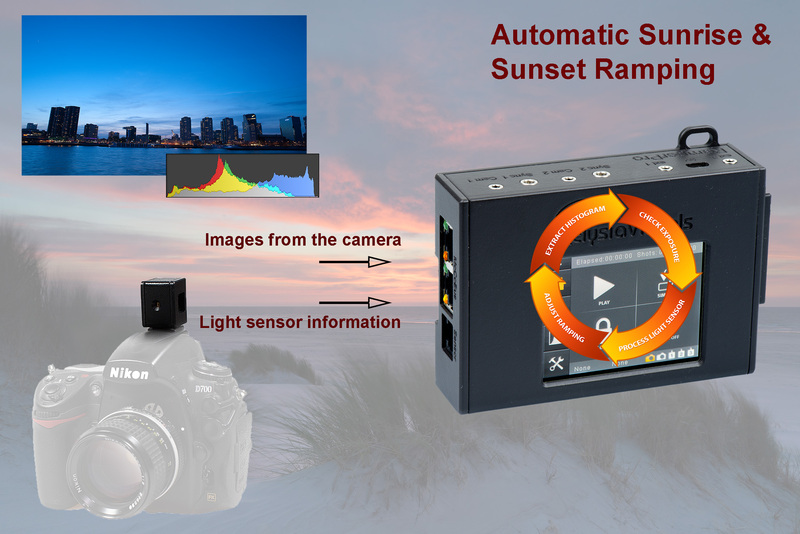 True automatic exposure ramping of sunsets or sunrises. This is done by analyzing the images that are taken by your camera. Built-in voltage meter that can monitor your battery power. A future version of the firmware will include an auto shutdown mode. Note that some of these features require additional hardware. Some RamperPro kits do not contain these items by default. You can select one TetherPro USB cable of choice with this bunlde. Please select the correct one. The Normal and Full Kit are not containing the USB cable that you need to connect your camera to the RamperPro. This cable should have been supplied with your camera.